Flagstaff is located in the north of Arizona on the Colorado Plateau, at approximately 7,000 feet (2,150 metres) above sea level. On historic Route 66, Flagstaff provides easy access to Sedona and the Grand Canyon. Cooler than the south of the state with a varied ecosystems and terrain, Flagstaff is an excellent base for hikers, campers and mountain bikers. The Grand Canyon is what most draws people to Flagstaff. The National Park is approximately 75 miles (120 kilometres) to the north, and Flagstaff is one of the most common places that visitors to the park stay. Walnut Canyon National Monument - Walnut Canyon National Monument is a 350 feet deep canyon (dropping from 6,690 ft to 6,340 ft) that used to be home to the Sinagua people. 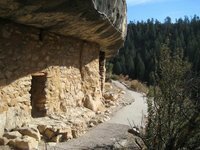 The Sinagua built their homes along the cliff faces, in small caves that were bricked up to provide shelter from the wind and snow of winter. The trail is very steep and requires climbing many stairs. Sunset Crater Volcano National Monument - Sunset Crater was made by a nearby volcano that first erupted in 1064 and last erupted in 1100. The landscape around the crater is black, volcanic rock, porous but hard. There are easy trails to hike around the crater, including a fully paved trail suitable for wheelchairs, strollers or people with mobility problems. The Coconino County Fair is held every September at the Fort Tuthill County Fairgrounds, featuring a demolition derby, livestock auction, carnival rides, and other activities. The Flagstaff Symphony Orchestra holds concerts from September through April at Ardrey Auditorium on the campus of Northern Arizona University (NAU). Route 66, known as the "Mother Road" was decommissioned years ago, but still remains prominent in the American psyche as an important part of their heritage. Despite the highway no longer officially existing, many areas of the road remain a "historic route", including the stretch that passes through the Flagstaff between Barstow, California, and Albuquerque, New Mexico. 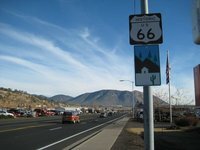 In early September, the city hosts an annual event, Route 66 Days, to highlight its connection to the famous highway. As a semi-arid highland desert, Flagstaff has mild weather conditions throughout the year. In the summer, the temperatures are up in the high 20 °C, with temperatures in the low-teens and single digits in the winter. Snow does fall during the winter, but with 283 days without precipitation a year, large accumulations of snow are not common. Air travel is available through Flagstaff Pulliam Airport (IATA: FLG, ICAO: KFLG, FAA LID: FLG), located just south of the city. In general, this is a general aviation airport, but there is some scheduled service from nearby locations, including Phoenix by US Airways Express and Los Angeles via Horizon Air. The Southwest Chief, operated by Amtrak, travels between Chicago and Los Angeles, stopping en route in Flagstaff. Flagstaff is located at the northern end of Interstate 17, which runs down to Phoenix. Interstate 40 runs through the city, travelling westbound to Barstow, California and eastbound to Albuquerque, New Mexico. Route 66 runs parallel to I-40. Bus service is provided by Greyhound, and also by other companies. Route 66 provides the main east-west route through the city, running parallel to the I-40. Historic Flagstaff can be found between Beaver Street and Agassiz Street, running north from the Route 66 up to Elm Ave, and includes the Santa Fe depot, which now serves as the Amtrak train station. Local bus service is provided by Mountain Line. Fares are $1.00 per trip, or $3.00 for a daily pass. Northern Arizona University (NAU) is situated in Flagstaff. We have a comprehensive list of accommodation in Flagstaff searchable right here on Travellerspoint. You can use our map to quickly compare budget, mid-range or top of the range accommodation in Flagstaff and areas nearby. This is version 28. Last edited at 12:18 on Dec 3, 18 by Utrecht. 7 articles link to this page.